This was a four night cruise to the Bahamas from Miami. 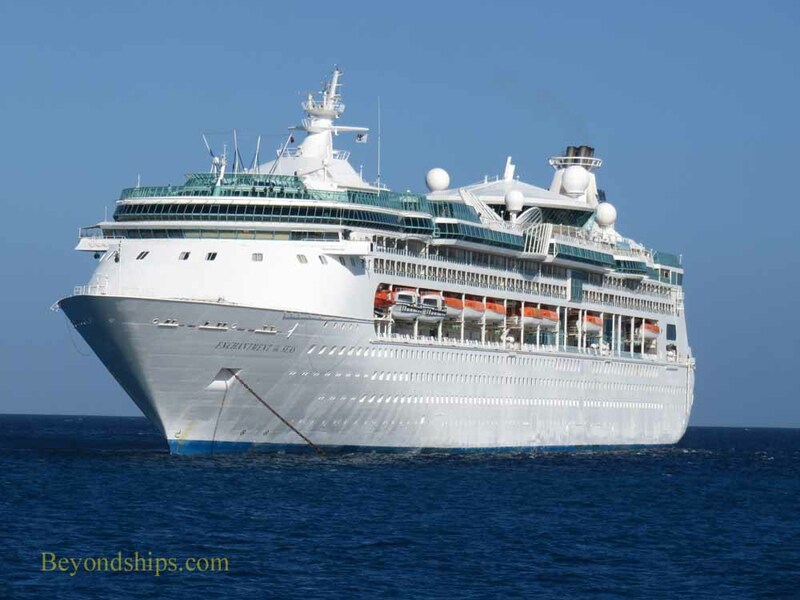 The ship called at Key West, Nassau and Royal Caribbean's private island Coco Cay. Enchantment is one of Royal Caribbean's Vision class ships. She was built in the 1990s and was the only one of the six ships in the class to be lengthened. Thus, she is somewhat longer than her sister ships but otherwise the ships are similar. This ship is not as large as Royal's newer ships and thus does not have all the features of the newer, larger ships. Thus, if you are looking for zip lines, water slides and other amusement park style features, Enchantment is not the ship for you. Instead, Enchantment presents a quieter, somewhat more traditional cruise experience harkening back to a time when cruise ships strived for elegance. The two level main dining room is a case in point. The décor was designed to capture the atmosphere of the musical “My Fair Lady.” It does not present the world of Eliza Dolittle when she was living in London's slums but rather the upper class world she aspired to join. It is a very pleasant room with a sweeping grand staircase and fluted pillars. This is not to say Enchantment is stuffy - - far from it. Rather, adjectives such as relaxed and friendly fit her. Enchantment's current role is to do short cruises out of Miami. Such cruises have something of a reputation of being party cruises. While the passengers aboard my cruise were clearly having a good time, this was not a boisterous or drunken, rowdy crowd. The people seem to have come aboard Enchantment for a short break or perhaps to add a cruise to a Miami or Florida vacation. There were quite a few members of the upper tiers of Royal Caribbean's loyalty program aboard. Most of them were already familiar with the ship. Thus, they could come aboard and quickly fall in with the rthym and atmosphere of the ship. I always think it is a good sign when the people who are most familiar with a partciular cruise line come back to a ship. Sailing from Miami, it is not surprising that there were many latin or Spanish-speaking passengers. Accordingly, many of the crew members are bilingual in Spanish and English and the announcments made over the public address system are made in both langauages. What was more surprising was the number of passengers from other countries. I heard German, Russian, French, Hebrew and various Asian languages being spoken. Thus, the passengers were a diverse mix of nationalities. Enchantment packed a lot of entertainment into the four nights of the cruise. This included two production shows in the main theater, a stand-up comedian and a juggler. Recent movies were shown on the giant screen above the main pool area each evening. In addition, there were Royal Caribbean standards such as the Captain's welcome party, the Love and Marriage Game, the 70s Disco Inferno theme party, an open deck party and the Quest adult scvanger hunt. Live music and dancing was offered in the atrium and in the Boleros latin-themed lounge. The casino was also busy. During the day, the line dancing classes in the atrium seemed to be popular. I was quite impressed by the dining in the main dining room. The service at breakfast, lunch (Coco Cay day only) and dinner was excellent. Along the same lines, the food was good and the menu had variety. As a result, I was somewhat reluctant to leave the main dining room for the ship's specialty restaurant, the Chops Grille. I have dined in Chops on most of the Royal Caribbean ships and this venue is consistently good. The Chops on Enchantment was no exception. I tend to order the same items each time at Chops because I have had outstanding experiences with them over the years on the various ships. The filet mignon is the signature main course and mine was tender and flavorful as usual. Venturing outside of my comfort zone, this time I tried the scallops appetizer and was pleased that I did because of the contrasting flavors. The service was very good as well. Most people that I spoke with said that they enjoyed the Chops on Enchantment. I did speak to one couple who said that they were disappointed in the veal. For lunch on the days that the main dining room is closed, guests can go to the Windjammer buffet or to the Park Cafe. (The Windjammer is located in the front of the ship, which comes as a surprise to some passengers who are only familiar with Royal's other classes of ship where the Windjammer is in the back). The food in the Windjammer is plentiful and there is variety. I had a decent but not remarkable hamburger there. But then, I am not a big fam of self-serve venues. The Park Cafe, located in the Solarium, is a much smaller venue. The main lunchtime offerings are sandwiches, a carvery and a salad bar. At the salad bar, you specify what ingredients you want and a staff member makes the salad. It is similar to the Tutti Salad Bar Royal Caribbean offers at lunchtime in its main dining rooms. Because of the size of the Park Cafe, you do not have as great an extent of choices as with the Tutti but still it is a good, fresh salad. Enchantment is scheduled to undergo a revitalization in 2017. Although the ship is kept very clean and everything appeared to work, there were signs of wear such as exterior rust spots. In addition, Enchantment does not have as many dining alternatives as on the Vision class ships that have already undergone revitalization. During this cruise, Enchantment passed through some rain storms. These did not cause any significant motion. The ship also had no problem keeping to her itinerary on time. Leaving Enchantment, I was taken aback by the thought that this had only been a four night voyage. Having traveled on Enchantment and most of her sisters before, it did not take me any time to settle in but even so I met so many interesting people and there was so much activity that it seemed like it was too much to have occurred in just four nights.